Police and mayor said it was for their protection. Several members of the media reported being blocked from covering the Occupy Wall Street raid overnight, with police pushing them back from the action and preventing reporting and photographing. And on Tuesday, several more journalists were detained by police, including AP writer Karen Matthews, AP photographer Seth Wenig and Daily News reporter Matthew Lysiak, the AP said. Sources told NBC New York they would not be charged. At one point during the overnight raid, journalists who identified themselves as working for the New York Post and New York Daily News were pushed back by police in riot gear, along with NBC New York's Chris Glorioso. Officers moved media away from the perimeter of Zuccotti Park soon after police began clearing protesters. Asked for an explanation on why the press was not being allowed to document the event, an official with the NYPD's public information office said "right now this is where you guys are allowed to be." At one point, Glorioso was escorted away from the site by an inspector, right past Police Commissioner Ray Kelly, who declined to comment. "I have to keep you moving, go to the end of the block please," the inspector said. "I have to move you from this area. I don't want you to get hurt." Using the hashtag #mediablackout, journalists tweeted throughout the raid about their dustups with police. New York Times reporter Brian Stelter tweeted that a Post reporter said he was "roughed up" by police, and NY 1 Education reporter Lindsey Christ tweeted that journalists were being "thrown to ground and pushed to wall if they get in front of the wrong officer." Mother Jones reporter Josh Harkinson tweeted that police "violently shoved me away" as he tried to take a photo of a man on a stretcher. "Cops telling me not even media with press passes allowed inside," he tweeted. The New York Observer tweeted "here with credentialed photogs from NYT, WSJ and Reuters they're also being barred from #occupywallstreet." Public Advocate Bill de Blasio said in a statement that clearing the park was "legally questionable" and added "that some media and observers were prevented from monitoring the action is deeply troubling." When asked why journalists were kept back, Mayor Bloomberg said at a City Hall briefing Tuesday that the NYPD "routinely keeps members of the press off to the side" and did so in this case to protect journalists from getting hurt. 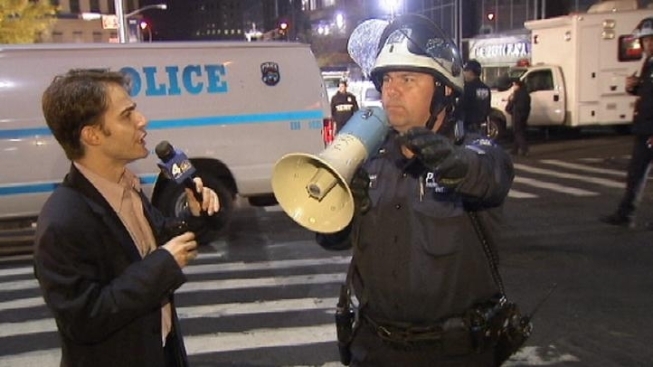 Full Occupy Wall Street coverage here.